For the berry puree, puree the berries in a food processor, or with a whisk until smooth. Strain to remove seeds, if necessary. Fresh or frozen berries may be used. 1 pint of berries will make about 1 cup of strained puree, enough for about 8 cocktails. For the cocktail, spoon the berry puree into the bottom of a champagne glass. Top off with the champagne. I concocted these Berry Bellinis for a recent late afternoon gossip session with my sister. We both love traditional Bellinis – which are made with white peach puree, a dollop of peach schnapps and, champagne or sparkling wine. However, white peach season has not arrived here in the Midwest, so I thought I would try a twist on this old favorite. It’s not often that a new cocktail recipe hits it out of the park on the first try – but in this case it was a home run. We both loved the beautiful color and sweet tart berry taste of this long cocktail. 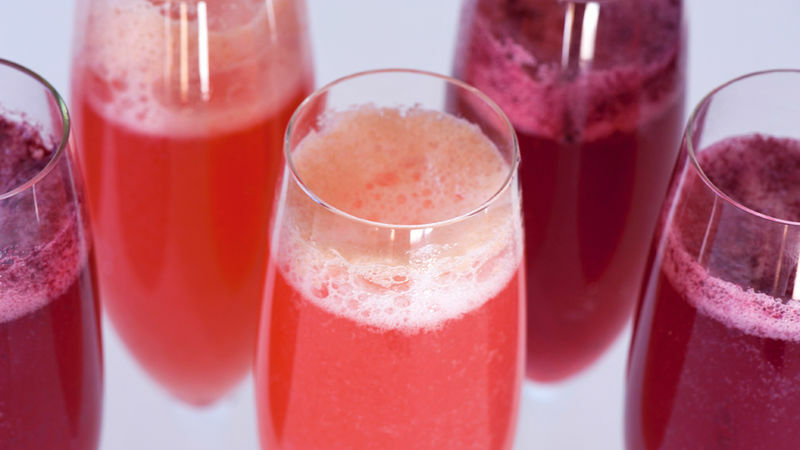 For a Berry Bellini, add a puree of your favorite berries, raspberry liqueur or schnapps to your favorite prosecco or sparkling wine. I used blackberries and raspberries, but blueberries or any of your favorite berries will work just as well. Straining the puree to remove seeds is completely optional of course, but I always do. Straining makes cleanup easier because it eliminates the possibility of a billion little seeds stuck to the insides of the glasses. A prosecco is far and away the best bubble for a bellini, in my view. It’s Italian (on theme! The original Bellini was invented in Venice! ), inexpensive (always nice . . . ) and the flavor is very light (doesn’t get in the way of all the beautiful fruit . . .). Hope you enjoy - these lovely Berry Bellinis are sure to become a mainstay in my cocktail repertoire.